Kingdom Hearts HD II.8 Final Chapter Prologue will launch very soon in Japan, with under just over 24 hours until the game is available. 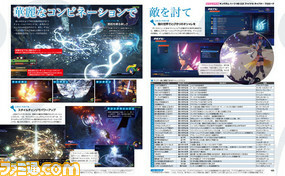 Famitsu was able to sit down with Tetsuya Nomura and they have a four page interview where they discuss the latest developments. This interview will be available in the upcoming Famitsu which will go on sale on January 12th 2017. Saken has translated the blurb from Famitsu! - A DEFINITE READ ONCE PLAYED THROUGH! 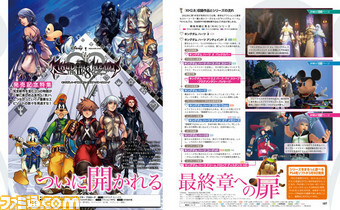 [Kingdom Hearts HD 2.8 Final Chapter Prologue] has raised the anticipation for [Kingdom Hearts 3]. In Famitsu's 1/26 issue (on sale 1/12), impressions are compiled and each of the 3 title's most attractive points are discussed! 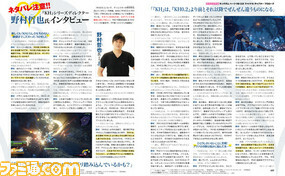 To end this special report, a 4 page interview with Series Director Tetsuya Nomura will be published! As well as discussing new story revelations (Spoilers alert), the interview will also touch on other very highly anticipated titles that Tetsuya Nomura is working on, such as Kingdom Hearts 3 and Final Fantasy 7 Remake! I didn't think we'd get another interview. What else is there to talk about? Without spoiling the game of course. They do note in the blurb that there will be spoilers. This all does seem really unnecessary. I'm always having fun translating interviews, and this doesn't obviously hurt anyone, but seriously. Huh. I wonder if it's an Ultimania-style postmortem interview. We've always had interviews with Nomura when a game launches in Japan. It lets him talk without restriction since the game is available for people to play and view. We might hold off on translating it though, depending on our translators plans and if they want to experience the game first. My bad: I meant to say the sheer number of interviews seemed really unnecessary, not this one in particular. Well I hope you guys can translate it, but it's all good even if you don't I guess. Would be unreasonable to complain about the amount of interviews and the complain about not getting all of them. Now it only remains to see if they are lowweight spoilers or the heavy stuff. In terms of DDD there's isn't really much to spoil, but for 0.2 and Back Cover there certainly is. I think it's time to go into a media blackout. I really want to avoid these kinds of spoilers in the next 12 days. I don't want even the smallest spoiler. I think this is probably going to be my last post until the 24th. We might hold off on translating it though, depending on our translators plans and if they want to experience the game first. Can you post HD scans though? Or even text transcriptions. I might try to translate some of it if I have time, but I would prefer if there were transcriptions available. In fact, if someone with more time could transcribe the text it would be a great help, as I haven't memorized many kanji, so I have to look up most of the time. Jisho.org is the site I use for transcriptions (and research). As for why I'm asking for transcriptions instead of doing them myself, it's because starting tomorrow I'll be busy until next week. I'll probably find time to watch the end of 0.2 and something of Back Cover, but transcribing Japanese texts takes too much time for me to do it. Also, I will only care about spoilers for KHIII. It's the only game I specifically want to complete without knowing the end. same here...i don't think I'll able go near this forum till the 24th. IF HE ASKS US TO BE PATIENT ONE MORE TIME... IT HAS BEEN OVER TEN YEARS OF BEING PATIENT... I started playing these games in the 6th grade, and I am now a graduated law student in my twenties. I'm sorry to say it, but it's getting to the point that 'understandable delays' are irrelevant. Either make the game or don't, don't keep pushing it back and dangling it in front of us. We are all sick of the delays. No one ever WANTS to keep waiting for something they want. But, they can't help it. That's how it goes for these games, waiting. But it doesn't mean we should just keep complaining that we don't got what we want at times. I understand completely, but in time they come, sometimes not soon, but they do. KH3 wasn't announced to be in development 10 years ago so I'm not sure what you've been waiting 10 years for.